These animals have been an integral part of humanity since man learned to farm. Both goats and sheep were among the first animals to be domesticated, but sheep have a particularly special place in our psyche. Sheep (lambs) have become an important religious symbol of Purity, Perfection, Sacrifice and Reverence. In Abrahamic traditions - Islam, Christianity, and Judaism - they were the perfect sacrificial animals and this accounts for the use of the term 'Lamb of God'. Eid al-Adha is an annual Islamic festival that commemorates Abraham's devotion and submission to God by sacrificing choice animals, mostly sheep. In the Christian tradition, it's no surprise why Christ is considered to be the ultimate shepherd and his followers are his flock of devoted and spiritually pure sheep. This concept is reflected in every aspect of Christianity. A Christian church leader is called a 'pastor', the Latin word for 'shepherd'. If you find yourself counting sheep in order to fall asleep, you can thank the British for that. The tradition of Yan Tan Tethera was a way for early English shepherds to count their stock. The numbers were said aloud in a manner that sounded like a rhyme, with adjacent numbers sounding similar to each other. In this system, 1 - 2 - 3 - 4 is pronounced Yain - Tain - Eddera - Peddera. Imagine counting an entire herd like that! It would be a breeze for boredom to set in and sleep to take hold. The practice Yan Tan Tethera fell out of favour during the Industrial Revolution, but the idea of counting sheep became synonymous with falling asleep. Tribal patterns have deep spiritual significance in the various cultures from which the individual designs originate. While the exact meaning of each tribal pattern is still shrouded in mystery, but one thing is clear: a Tribal Sheep Tattoo is a great way to pay homage to your spiritual side, since both the patterns and the animal that they are used to depict are deeply rooted in the Divine and the Philosophical. You are a rebel. Playing by the rules and following the herd are things that you'll never be caught dead doing. 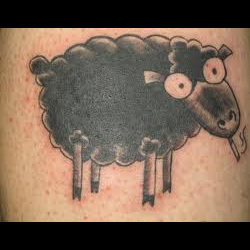 You've been labelled a 'black sheep' and getting a Black Sheep Tattoo is the perfect way to show that you're proud of your title. In nature, it is a recessive gene that codes for black fleece. Stigma was attached to these poor creatures for commercial reasons; black wool is difficult to dye, as such wool traders (and eventually the general public) deemed black sheep within a herd as a sign of evil. Nowadays, being called a 'black sheep' shows your refusal to conform to the status quo. From Lamb Chop to quirky comics, lambs are the ultimate symbol of childhood innocence. They are mainstays in fairytales, children's literature, and toys for tots. 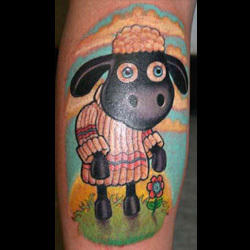 A Cartoon Sheep Tattoo is a way to reconnect to your childhood or to commemorate the innocence and beauty of a child in your life. 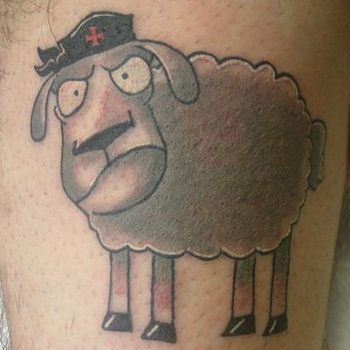 From counting sheep to being a black sheep, choosing the right tattoo design is tricky. Find one that matches your personality, style, and represents what you want to express to the world. Think about where your new ink will be placed on your body, since the position of your tattoo is just as important as its meaning. 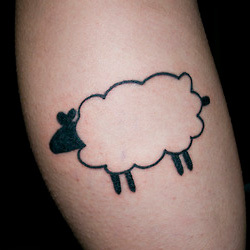 If you need some help creating the perfect Sheep Tattoo, then visit our design page at www.itattoodesigns.com and take advantage of our Custom Design Service. Our team can design a truly unique piece for you.